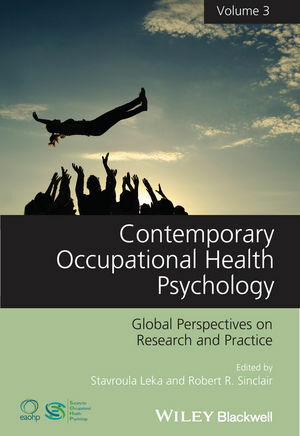 The third volume in an acclaimed biennial series showcasing the latest global thinking, research, and practice in the rapidly-evolving field of occupational health psychology. Stavroula Leka is Associate Professor in Occupational Health Psychology at the University of Nottingham, UK; and Director of the Centre for Organizational Health & Development, a World Health Organization collaborating centre in occupational health. She is a Chartered Psychologist, Chair of the International Commission on Occupational Health’s Scientific Committee on Work Organization and Psychosocial Factors, and a member of the Executive Committee of the European Academy of Occupational Health Psychology. She is co-editor of Occupational Health Psychology (Wiley Blackwell, 2010) and of the two previous volumes of Contemporary Occupational Health Psychology. Robert R. Sinclair is a Professor of Industrial-Organizational Psychology at Clemson University. Prior to coming to Clemson in 2008, he served as a faculty member at Portland State University from 2000-2008 and at the University of Tulsa from 1995-1999. He is a founding member and past president of the Society for Occupational Health Psychology. His research focuses on individual and organizational factors that contribute to workers occupational safety, health, and well-being with a particular focus on health care, military, retail, and educational settings.